This 12 gauge ammo loaded with #4 shot comes by way of a 1 1/8 ounce shot cup in a 2 ¾” shell with a 1,255 feet per second velocity out of the muzzle. A brilliant choice for ground game or ground birds and suitable for use on heavy game and waterfowl within reason (short ranges) and where regulations allow you to use lead shot. 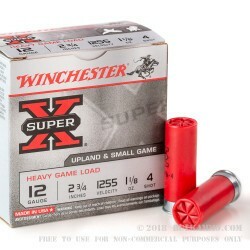 A standard in the industry, the Super X line by Winchester is a proven, reliable shotgun line that offers all the best loads in all the best configurations for anything from ground game and nuisances to large game at moderate distances. This #4 shot is a very versatile round depending on the ranges you’ll be shooting at and the gun/choke you’ll be shooting out of. Generally, #4 can be one of the more versatile shotgun pellet sizes with uses even including certain law enforcement and home defense purposes. Note however, this is a dedicated, purpose built #4 shotshell for field use on game. Suitable for use in any 2 ¾” chamber for 12 gauge shotguns of any type. This is a very reliable, versatile cartridge that fills a good portion of hunter’s needs in a single cartridge.